While our philosophy may be simple, our strategy is based on very sophisticated investment analysis. We believe an investment strategy must perform well through a variety of market environments, particularly over longer periods of time. To help accomplish this goal, we have identified certain characteristics of assets that often merit further analysis and review. Of these, quality, consistency, and discipline are the key factors that frame our overall investment strategy. High-quality growth companies and high-quality bonds selected to temper stock market volatility form the basis of our blended portfolios. 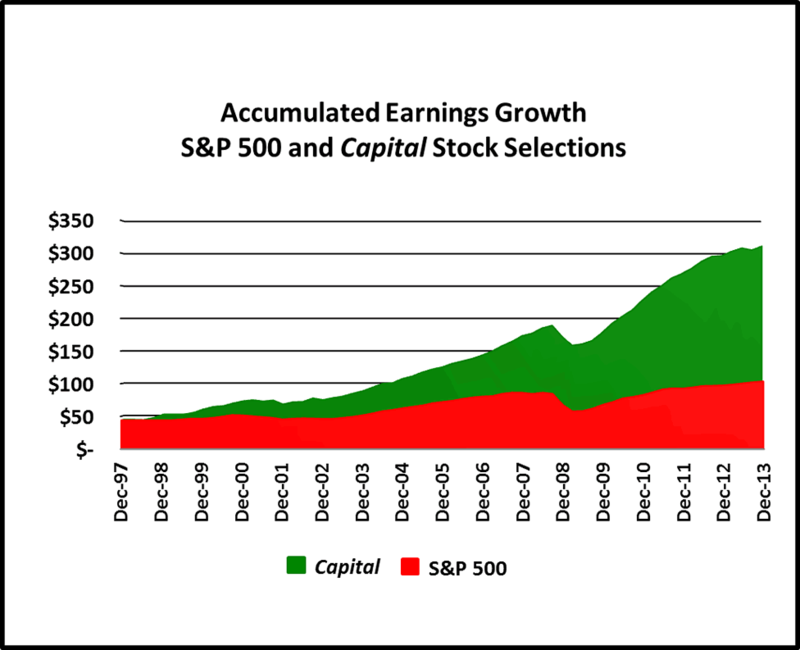 Earnings growth supported by similar or better cash flow growth. Solid balance sheets that can support the business through uncertain economic conditions. Experienced and accessible management teams focused on efficient cash flow allocation. Bonds with modest interest rate risk characteristics. This significantly reduces both credit-related risk and price volatility. Carefully selected high-quality bonds of intermediate-term duration are managed in an active process. Market demand for products and services are relatively steady in all economic conditions. Flexible business models that can minimize the impact of weak economic conditions. Less capital intensive businesses generate high levels of free cash flow that management can allocate (M&A, dividends, share repurchase). For bonds, because quality and consistency are themselves dynamic and can significantly change at different points in time, disciplined, active management of these variables is necessary if bonds are to fulfill their intended roles within a portfolio. In our “toolkit” for actively managing the dynamic risk/reward/correlation parameters are computer simulation scenarios. We start by assessing the best and worst case scenarios for interest rates, bond yields and economic conditions for the coming twelve months. We use a computer simulation to calculate the total return potential for bonds of varying maturities and quality. This information then forms the basis for managing portfolios around bonds that offer a low probability of loss should interest rates rise while also maximize the probability that bonds will deliver the desired correlation properties relative to other portfolio investments. Maintaining this disciplined approach helps us separate fundamentals from market noise. Our investment approach typically involves relatively low turnover within a portfolio. Therefore, it tends to have the hidden benefits of both relative tax efficiency and low transaction costs. And because every single investment is disclosed each month through a third party custodial statement, client portfolios are fully transparent to them. An essential and differentiating aspect of our bond management is the emphasis we place on selecting bonds that temper stock market volatility. Patient and disciplined adherence to this approach helps us preserve capital for clients. Also, and perhaps most importantly, during periods of stock market duress, it is common that an investor’s anxiety is intensified by other financial factors. For instance, an investor may be fearful of the possibility of job loss or business setback for themselves or loved ones. The value of their residence(s) may decline. They may observe a once popular business close. The financial world may seem to be closing in around them. A properly blended and managed portfolio can help mitigate the duress experienced during inevitable setbacks by helping preserve capital and mitigate anxiety. This in turn, may allow the discipline to get through difficult stretches and stay on course to accomplishing their specific investment objectives. Our equity investment strategy is based on fundamental analysis and seeks to create a portfolio of companies that grow their profits faster and more consistently than the overall market. 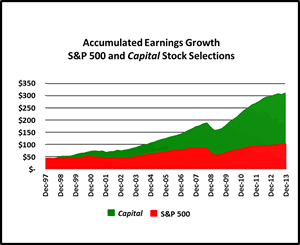 As demonstrated in the chart to the right (click it for a larger view), our disciplined analysis of quality, sustainability, and consistency results in a portfolio of companies that generates faster and more predictable earnings growth than the market over time. The higher level of predictability serves as the fundamental foundation for lower volatility across a full market cycle. If you would like to dive deeper into our equity strategy, please click here. In addition to investing in high quality bonds with modest interest rate risk characteristics, we also actively manage the fundamental parameters of our clients’ bond investments. Our bond investment strategies are implemented using only high-quality bonds with modest interest rate risk characteristics. This significantly reduces both credit-related risk and price volatility. Bond investments are only made after all three of these parameters are evaluated. Because these parameters are themselves dynamic and can significantly change at different points in time, disciplined, active management of these variables is necessary if bonds are to fulfill their intended roles within a portfolio. We use a computer simulation to calculate the total return potential for bonds of varying maturities and quality. This information then forms the basis for managing portfolios around bonds that offer a low probability of loss should interest rates rise while also maximizing the probability that bonds will deliver the desired correlation properties relative to other portfolio investments. Maintaining this disciplined approach helps us separate fundamentals from market noise.